A very interesting time to find yourself in Rio: Amelia weighs up the experience of visiting the city this summer with the Cultural Olympiad and Graeae. My job has given me the opportunity to do some amazing things. 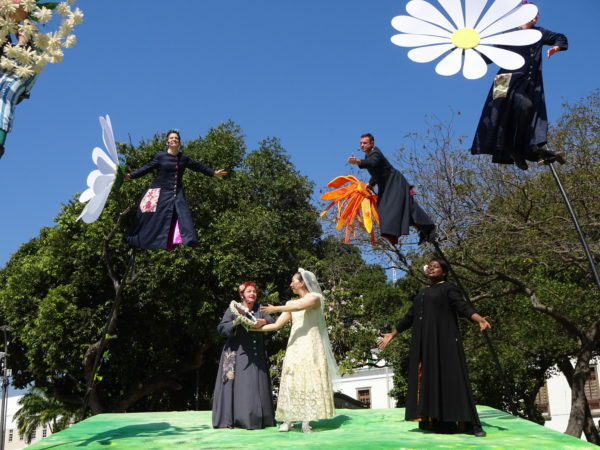 Most recently, I travelled to Rio with Graeae Theatre Company’s production of The Garden one of the events connected to the Cultural Olympiad. It afforded me a great number of new opportunities, which included seeing a part of the world I had never seen, and being there at a particularly historic time. Because we were traveling as part of the Cultural Olympiad, people at home (for me USA and UK) and in Rio were confused about what exactly I was doing out there. My mom very excitedly asked me what TV channel would be broadcasting my performance, and several friends assumed I was part of the Paralympic Opening Ceremony (not an entirely unfounded idea given that I did it four years ago). Even many Brazilian people would begin conversations with me and my fellow company members by asking what sport we played, not a complete surprise given the amount of disabled athletes in the city at the time. Brazil is also at a very interesting time politically. President Michel Temer has taken over after the suspension of Dilma Rousseff, Brazil’s first female president. Temer was not elected for this job; he has taken over to fill Rousseff’s place and will now be in post until the next election in 2018. He has also filled his cabinet with an all-male, all-white cabinet to run what is one of the most ethnically diverse areas of the world. Many, including Rousseff, have accused Temer of sabotage and conspiracy. Rousseff has been a progressive president, and Temer is notoriously conservative. It is a story that seems to be echoing around other parts of the world (*cough* Brexit. *Cough* Donald Trump.) and in Rio there was a huge amount of Graffiti on the topic, as well as multiple cries of “Fora Temer!” (Get out Temer!). I also had conversations with more than a few of the locals in Rio who stressed that they wanted disability equality, that they love the Paralympics and that they hope the world understands that their government is not currently reflecting how they feel and what they want. More positively, I found Brazilian people to be wonderfully open and friendly. Being part of a large group of disabled people that included a blind person, many Deaf people and many amputees, we were stared at pretty much every time we went out of the hotel. However, it never felt hostile, and more importantly, it was never hidden. Why would you? They were curious because they probably had never seen a group of people like us before. There is absolutely nothing wrong with that. Also, there is no real sense of personal space in Rio, and I think this is a lesson the UK could do with learning. One night, we went to a Samba – a street party with live music. At one point, I was walking through a very crowded street and up a set of uneven steps with a friend. I was struggling, partially due to the unevenness of the steps and partially due to the caipirinhas I had been drinking. As I walked up, a number of hands reached out to help me steady myself by very lightly taking my free arm (the other one being linked with my friend). In London, if someone were to reach out and grab me unannounced, I would not take it well. In Rio, it was harmless, friendly and quite helpful. Our preference for isolation and defensiveness is a very English (and American) way of behaving, and I don’t think it’s healthy. Rio is definitely not the safest place in the world, is currently not the most politically stable and it needs to do a lot to become accessible. Yes, there were problems with the Paralympics that were never resolved which is shameful. However, the city is full of a beautifully diverse culture that was more open to me being there than I could have possibly expected. It was a truly gratifying experience before we even performed our show which was extremely well attended and highly celebrated. Rio’s Olympics & Paralympics feel like a bit of an underdog story, and they definitely deserve to be celebrated given what Brazil has been through and is still going through. For Amelia’s previous columns on Rio, see What is A Superhuman, Anyway? and I am Not a Superhuman – So Stop Saying It!